(TibetanReview.net, Jun23, 2016) – Despite being warned off by Professor Taowen Le of the local Weber State University, Governor Gary Herbert of the US state of Utah on Jun 21 not only met with the Dalai Lama but also had his picture taken with him, tweeted it for all the world to see, reported sltrib.com Jun 22. Earlier, in a warning letter, Professor Taowen Le had said that officials could jeopardize the state’s relationship with China if they met with the Tibetan spiritual leader. But Utah leaders said the China connection didn’t mean giving up core values such as freedom of speech, reported AP Jun 22. The professor was reported to have helped broker Utah’s relations with China. 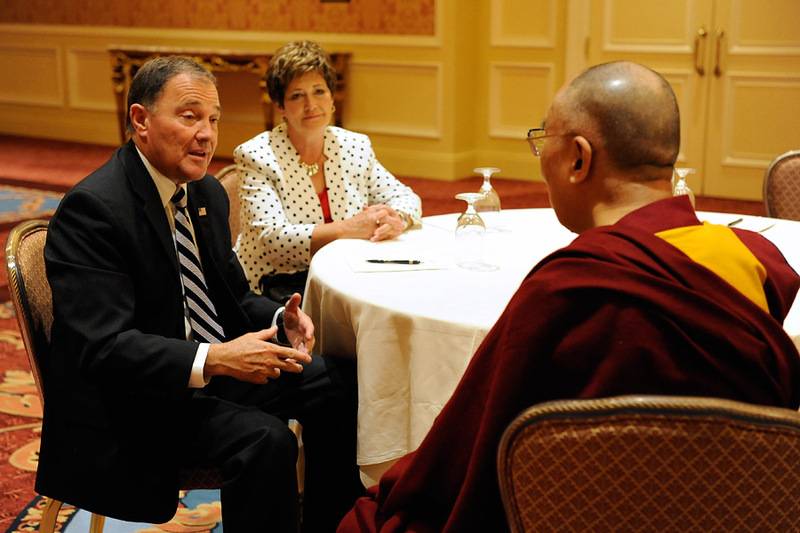 The report said Governor Gary Herbert hosted a private lunch for the 80-year-old Dalai Lama that was attended by former presidential candidate Mitt Romney and the mayors of Salt Lake City and county. The Tibetan leader was also scheduled to meet the next day with two senior Mormon church leaders. Professor Taowen Le’s sentiment was seen as echoing Beijing’s position on President Barack Obama’s meeting with the Dalai Lama the week before. The main purpose of the Dalai Lama’s visit was to deliver a speech that day on compassion and universal responsibility to a capacity-packed crowd of 8,000 in the Huntsman Center of the University of Utah, Salt Lake City. The event made up for a cancelled Oct 2015 appearance by the Tibetan leader. He spoke, wearing, initially, the Presidential Medal presented by David W Pershing, president of the University of Utah, along with a Utes visor to shield his eyes from the glare of the sun. His speech focused on his life’s commitment to three major principles: the promotion of basic human values in the interest of human happiness, the fostering of inter-religious harmony and the preservation of Tibet’s Buddhist culture of peace and non-violence. He also spoke on environmental issues and answered questions. The event was reported to have raised about $94,000. The amount was said to have been earmarked to go to the local Primary Children’s Hospital, homeless services, and the Utah Tibetan Association to benefit the Tibetan Community Center, a gathering place to celebrate and encourage the preservation of Tibetan culture. A part of the amount was also to go to the Dalai Lama’s charitable organizations.